ABBOTTABAD, PAKISTAN (ANS, Dec. 10, 2016) – Forty-seven people on board a Pakistan International Airlines (PIA) flight that crashed on Wednesday near Abbottabad were killed, the airline said, according to the British Pakistani Christian Association (BPCA). PIA Chairman Azam Saigol said a pilot made a mayday call, saying he had lost control of one of the two engines, BPCA reported. According to the BPCA report, Saigol said it’s “highly unlikely that this was a terrorist attack.” He added that the bodies of the victims would be transferred to hospitals in Islamabad at 12:30 p.m. local time. PIA, in a statement released Thursday, said 500,000 rupees ($5,000) cash will be given to the next of kin of the 47 victims to meet funeral expenses. The airline clarified that all 42 passengers and 5 crew members were killed instantly as the plane erupted in flames on landing, after the plane lost communication with a control tower on its way from Chitral to Islamabad. The plane crashed high in the mountains of Abbotabad and Havelian killing a famous former pop star who became a religious cleric named Junaid Jamshed. BPCA said Jamshed soared to fame in the 1980s with Vital Signs, one of the most iconic pop bands in Pakistan. After a successful career as a solo singer in the 1990s, Jamshed gave up pop stardom to focus on religious music, or nasheeds. Two infants were among the passengers, according to a passenger manifest published by Pakistan International Airlines. Meanwhile Pakistan’s National Disaster Management Authority has retrieved 46 of the 47 bodies of those killed in the crash, BPCA said. Evidence of an engine fault in the left engine of the plane has emerged, and families who have lost loved ones are seeking a government inquiry into the deaths of those they have lost. In its report, BPCA said one of the victims was Khawar Sohail, a 28-year-old Christian who worked a Regional Manager at International Khurdish Artist Network (IKAN) within their engineering service. His father, retired army officer Kadim Masih had five children of which Khawar was the fourth child. Sohail’s family lived in Green Town, Lahore and Khawar had been the family’s main bread-winner for a good number of years. BPCA said Khawar Sohail attended Grace Assemblies of God Church in Lahore. The church has been saying prayers for him and his family since news broke about his death. He was an active member of the church and helped with organizing Christmas and Easter functions, and it was hoped that he would soon be married. Sohail’s family have been informed that Khawar’s body will be identified within four or five days. An officer from BPCA officer has already visited the family with a bouquet of flowers. He has shared condolences with the family, and is hoping to provide help and assistance during their grief and loss. 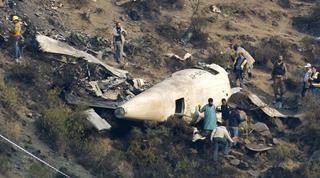 Photo captions: 1) Wreckage of PIA Flight PK 661. 2) Junaid Jamshed, said to have been Pakistan’s Robbie Williams. 3) Khawar Sohail, Regional Manager at International Khurdish Artist Network (IKAN). 4) Michael Ireland. About the Writer: Michael Ireland is a volunteer internet journalist serving as Senior Correspondent for the ASSIST News Service, as well as an Ordained Minister who has served with ASSIST Ministries and written for ASSIST News Service since its beginning in 1989. He has reported for ANS from Jamaica, Mexico, Nicaragua, Israel, Jordan, China, and Russia. Please consider helping Michael cover his expenses in bringing news of the Persecuted Church, by logging-on to: https://actintl.givingfuel.com/ireland-michael.